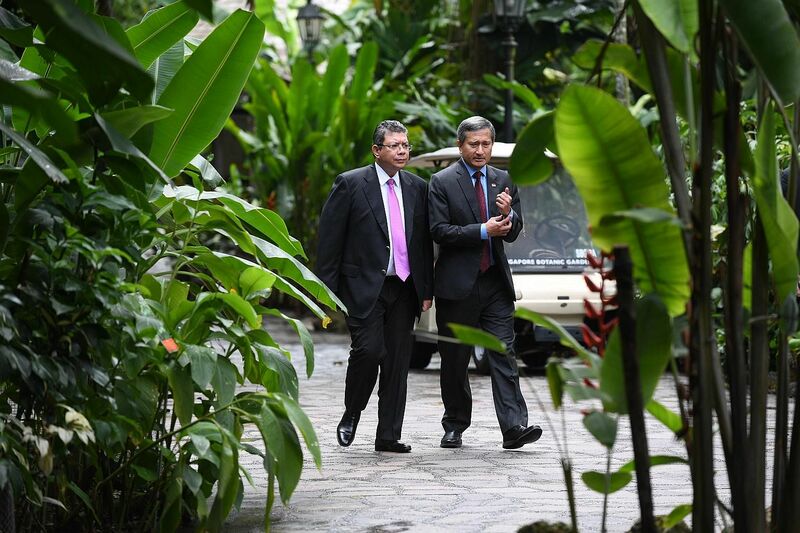 SINGAPORE - Singapore will do its best to discuss all outstanding bilateral issues with Malaysia in a calm, reasonable and focused manner, said Foreign Minister Vivian Balakrishnan in Parliament on Monday (Jan 14). But he also stressed that he does not expect a quick or smooth resolution to these issues, which include the disputes over maritime and airspace boundaries. Last October, Malaysia unilaterally extended the Johor Baru port limits into Singapore's territorial waters off Tuas. It has also raised objections over the implementation of new Instrument Landing System procedures for Seletar Airport. "Both of these sets of sudden actions upset the status quo that has been in place for many years," said Dr Balakrishnan in his ministerial statement, in which he set out the facts of each issue and highlighted steps that both countries have taken to find a constructive way forward. "These actions did not bode well for our bilateral relationship. They created the risk of a dangerous downward spiral of measures and counter-measures." Singapore was scheduled to host a meeting of the Joint Ministerial Committee for Iskandar Malaysia on Monday. But the meeting was postponed after Johor Chief Minister Osman Sapian "most regrettably" staged a publicised visit to a Malaysian government vessel anchored in Singapore's territorial waters off Tuas. Datuk Osman shared photos of the visit on Facebook. "The intrusion by the Johor Menteri Besar went against the spirit of the agreement between Foreign Minister Saifuddin and me just one day before," said Dr Balakrishnan, who met his Malaysian counterpart in Singapore last Tuesday to discuss the disputes. "It undermined the goodwill and trust necessary for further cooperation between the two countries, especially cooperation involving Johor." Dr Balakrishnan added that his discussions with Datuk Saifuddin Abdullah and Malaysian Minister of Economic Affairs Azmin Ali before and after the Johor Chief Minister's intrusion have been "amicable and constructive, focused on trying to resolve the issues". He said that he met Datuk Seri Azmin on Sunday. Mr Azmin also met Coordinating Minister for Infrastructure and Transport Minister Khaw Boon Wan and Minister for National Development Lawrence Wong on Monday, to discuss several bilateral projects. "Despite these current difficulties, Singapore still hopes to work with Malaysia for better relations, and closer cooperation that benefits both sides," Dr Balakrishnan said. "But both sides must act in good faith, in compliance with international law and norms, and honour existing agreements." He concluded his speech by emphasising the importance of Total Defence and Singapore's investment in the Singapore Armed Forces, saying that "the strength of Singapore's diplomacy depends on domestic unity and resilience, and the fact that we cannot be intimidated or bought". Resilience, he said, includes improving Singapore's water supply infrastructure, namely Newater and desalinated water, strengthening food security by diversifying food sources, and ensuring a strong, diversified labour market. "As a small state with limited resources, the quest for security and resilience has been a constant, relentless imperative for us since independence," he said. "It is not something that we look at only in times of unease." He also expressed confidence that "we can continue to rely on strong bipartisan support from this House, and unity of purpose among fellow Singaporeans".